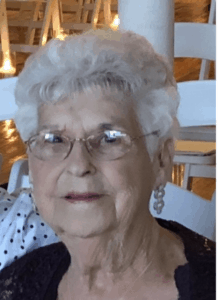 Grafton – Jeanne L. (Angers) Gemme, 87, passed away at home, surrounded by her loving family, Jan. 23, 2019 following a brief illness. Her husband, Adelard Gemme, passed away in 1987. She is survived by her children, John Gemme and his wife Janet, Bill Gemme and his wife Carolyn, Mark Gemme and his wife Kathy, and her grandchildren, Michelle Gemme, Erin Guyette, Kaitlin McSweeney, Maryann Cameron, Patrick, Daniel and Stephen Gemme and Danielle Bazinet, along with 12 great-grandchildren. She also leaves her sisters, Gloria and Rita Angers and Cecile Mosher. She was predeceased by her young son, Paul Gemme. Jeanne was born April 16, 1931 in Worcester, daughter of the late Ann Marie (Bouvier) and J. Adelard Angers, and graduated from Girls Trade High School. She worked at home and for Filene’s as a seamstress, stayed at home for a time with her young family, and also worked in the cafeteria at the Grafton Public Schools for many years. She was known for the pride she took in her home and gardens and was a faithful steward of her beloved church, St. Mary’s in North Grafton, where she served as a Eucharistic Minister and CCD teacher. All are welcome to gather with Jeanne’s family and friends Monday, Jan. 28, from 9:30-11 a.m., at Roney Funeral Home, 152 Worcester St., North Grafton, followed by a prayer service at 11 a.m. in the funeral home. She will then be laid to rest at Pine Grove Cemetery in North Grafton. In lieu of traditional remembrances, please honor Jeanne with a donation to The Grafton Food Bank, PO Box 324, Grafton, MA 01519.